Segway Nation offers its 1.5 hour Austin Sightseeing and Capitol Segway Tour three times daily. This Austin Segway tour is a great way to get an overview of downtown Austin and spend some time sightseeing and taking photos. Highlights of this Segway Tour include the Texas State Capitol Building • Congress Avenue • Historic Driskill Hotel • Warehouse Entertainment District • Town Lake/Lady Bird Lake • More Great Historic Sites and Landmarks • Lots of time to enjoy riding through downtown Austin on your Segway. 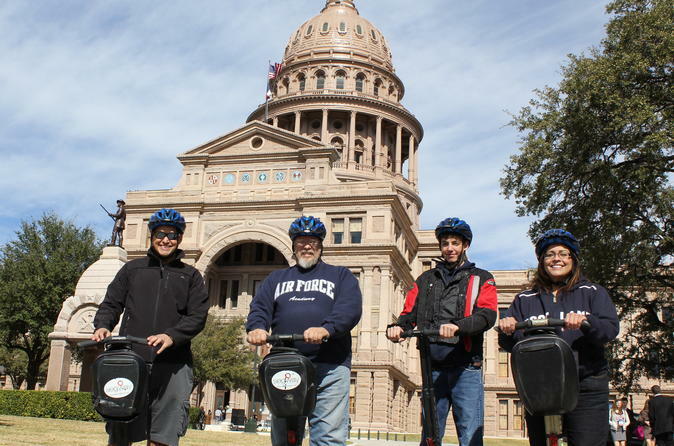 Segway Nation offers its 90 minute Austin Sightseeing and Capitol Segway Tour three times daily. This Austin Segway tour is a great way to get an overview of downtown Austin and spend some time sightseeing and taking photos. Highlights of this Segway Tour include the Texas State Capitol Building • Austin's main street - Congress Avenue • the Historic Driskill Hotel • Warehouse Entertainment District • Town Lake/Lady Bird Lake • More Great Historic Sites and Landmarks • Lots of time to enjoy riding through downtown Austin on your Segway and time to take great photos. Book now as reservations go fast!